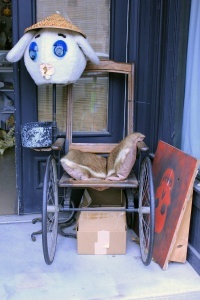 Stepping up to the black door of 101 23rd Street North, a rickety old wheelchair with bunny costume head hanging off greets everyone coming to experience a new adventure. Stepping through the dark door guests are transported into a world of wonder. Adam Williams, Birmingham native, takes what he calls home decor to a new level. Williams’ store, Birmingham Oddities, has attracted everyone from artists to children with the unique finds displayed in cases, bookshelves and hanging off the walls and ceiling. These bookshelves even house jars with tribal human trophy skulls. 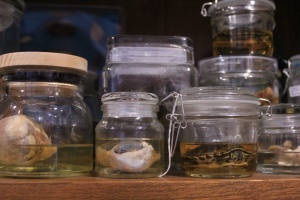 A bookshelf of jarred specimen. Williams started a personal collection of natural history and science oddities when he was young in the search for things such as fossils and raccoon skulls. It then grew enough to open a store in downtown Birmingham in 2015. “I love the feeling of wonder,” said Williams. “It makes me go back to being a kid again.” In such a buzzing world, as kids turn to adults, they are “saturated” with noise, losing their sense of wonder. Willaims wants each visitor to take a journey and have a space to wonder. Check out the oddities he has to offer only on Saturdays in the heart of Birmingham.